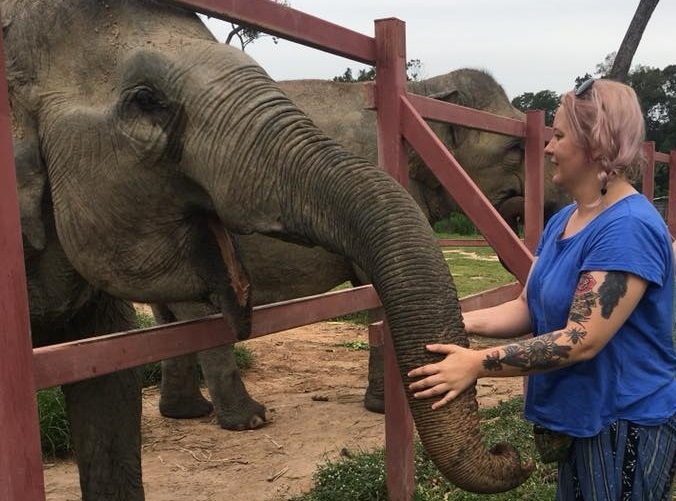 Amelia Thackray, a student of Cultural and Media Studies and a Lifelong Learning Centre PHE graduate chose to volunteer in Cambodia at a wildlife sanctuary because it combined three of her favourite things: animals, conservation and culture. In this article, Ameila shares her experience and perspective of Cambodian culture including how they treat animals. There are also suggestions for ways you can get involved to have a positive impact too. Cambodia has no animal protection laws to safeguard the treatment of its animals, whether butchered for food or not; and so it is up to sanctuaries to provide education, rescues and animal welfare using the generous donations provided by foreign aid and volunteers. The Asian elephant has been used by humans to pull and carry logs in the commercial logging industry for many years; forced to take part in the deforestation which is destroying their natural habitat. Despite the logging bans that were implemented in 1989, elephants are still used in the illegal logging industry and due to the treatment, they receive at the hands of their captors the elephants are unlikely to reproduce as they do in the wild. This treatment involves beatings and torture to subdue them, separating and isolating them from one another and overworking them to exhaustion. Due to the use of Asian elephants in the logging and ‘entertainment’ industries, there are only approximately 300 wild elephants in Cambodia. These numbers are diminishing rapidly because they are still being poached for the illegal logging trade and begging. The dog meat trade is popular in Cambodia as it is in other Southeast Asian countries, and although this is due to poverty and the need for nutrition, there are also superstitious beliefs involved. Dog meat is a cheaper alternative to chicken, beef, or pork and it is a tradition to eat it as it is tradition to eat roast beef in England. However, the process for providing the meat is cruel and barbaric, and seen to be completely different to the respect shown to other animals such as cows or chickens. The dogs are tortured and killed in front of citizens, who walk by as if immune to the cruelty. The animals are tortured to ‘tenderise’ the meat, due to a belief that tough meat has less medicinal value and that it will affect a man’s libido if consumed. Also, a nation-wide superstition in Cambodia is that if one eats a black dog, with no other markings or colours on its body, any internal illnesses you may have will be cured. It is rare to see a black village dog because of this superstition. 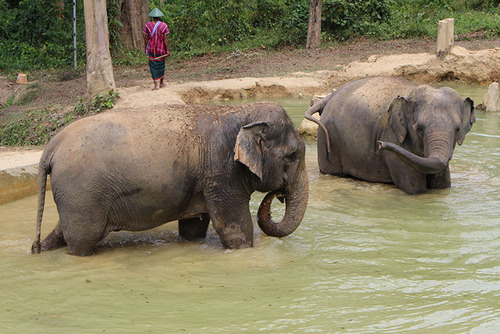 Captive wild animals are often exploited in Cambodia as a means of income. These animals, generally elephants and primates, are starved and tortured to render them submissive and pliable. When they are fed, the primates are given only white rice, which has no nutritional value and the elephants are undernourished as the owners cannot afford to provide the necessary sustenance (Asian elephants eat 10% of their body weight in vegetation every day). As recently as June 2018, there have been reports of orangutans being forced to dance, ride bicycles and fight each other in a Cambodian Zoo for human entertainment. 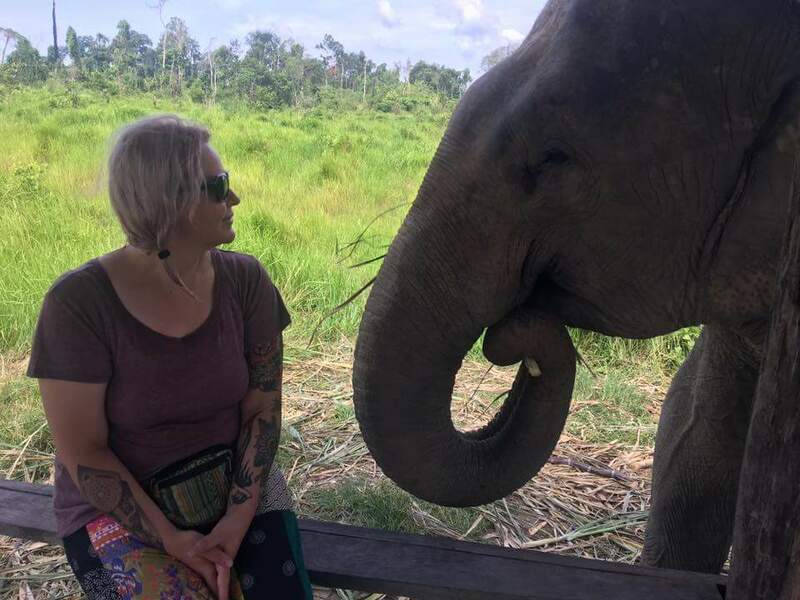 On my trip to Angkor Watt, I witnessed two female elephants exploited for public riding – I was shown a video with footage of the elephants being beaten with bullhooks to subdue them when I was at the sanctuary. 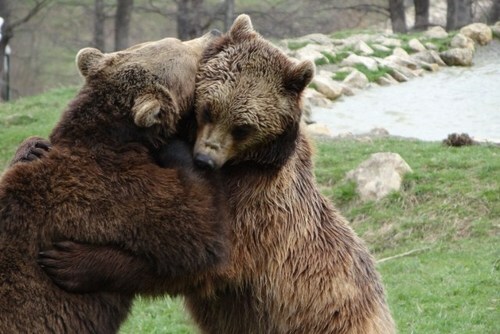 The suffering these animals endure for the sake of entertaining human beings is unbelievable and horrifying. 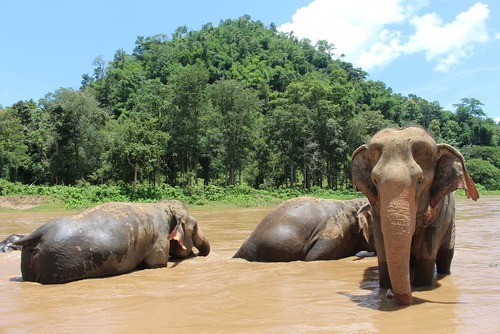 Located in the provinces of Siem Reap, Odor Mean Chey and Preah Vihear, The Cambodia Wildlife Sanctuary is home to three rescued female Asian elephants, 28 dogs, 13 adult gibbons, 20 baby gibbons and two leopard cats. They run a one-million-acre wildlife and conservation project in-conjunction with Save the Elephants Foundation, aiming to not only rescue and rehabilitate animals, but to replant trees and plants lost during years of deforestation. They also provide jobs for the local community as well as on site accommodation for paid staff and volunteers. As a rule, the Cambodian Wildlife Sanctuary does not purchase animals from former owners as they do not want to create a trade, however; there are a number of gibbons at the sanctuary who have been purchased to prevent further suffering and who are now both healthy and semi wild. 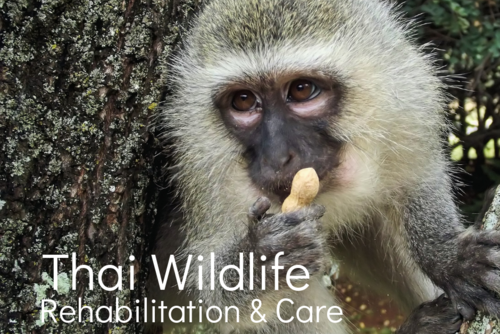 The project is unique and looks after domestic, semi wild and wild animals who live on the reserve (such as a wild white female gibbon who visits a rescued male – hopefully these will mate). 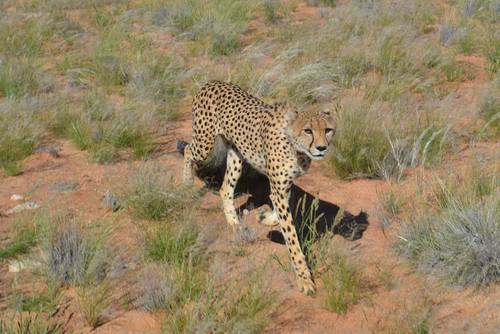 They are also building new enclosures (I helped!) so that they can rescue two more bull elephants from Pakistan. 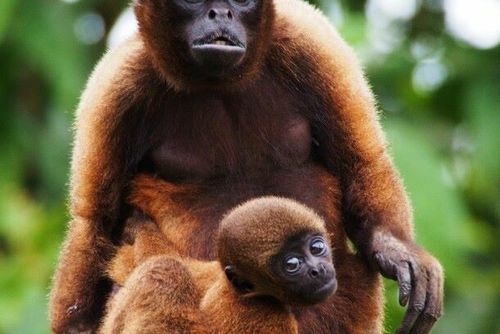 The gibbons have an enclosure that is always open, and they fend for themselves, however; they have a safe place to return to should they wish. 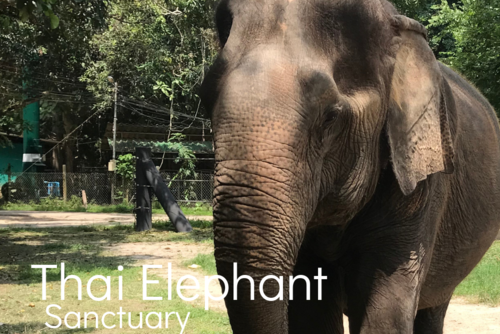 The sanctuary is still young and therefore relies on the import of food for the animals, however they are in the process of planting sugar cane fields and banana plants, so they can be more self-sufficient. 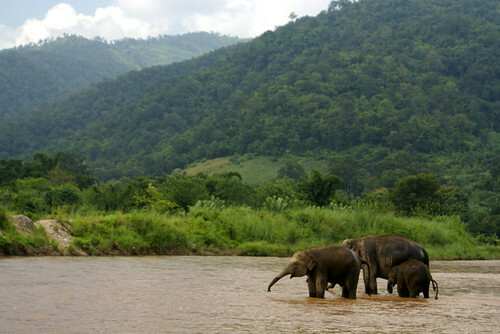 The three elephants who live at the sanctuary are left to be as wild as possible, but the ever-lingering threat of poachers means that they are escorted by a team of mahouts on walks through the jungle between the hours of 08:00 and 16:00 and are safely returned to large enclosures overnight. From 16:00 they are spoilt by the volunteers who feed them bananas and sugar cane for their supper and give positive human contact. As the saying goes: an elephant never forgets, and the energy they have known from humans has been constantly negative and brutal for many years. 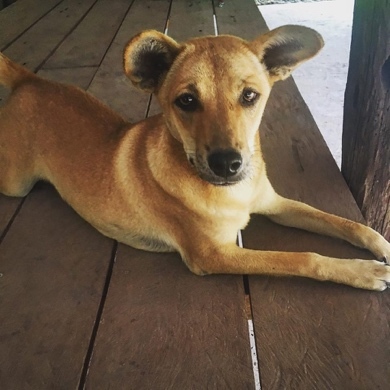 At the Cambodian Wildlife Sanctuary, there is a dog shelter on the site which looks after 28 dogs and counting. They take in strays, injured dogs and those rescued from the dog meat trade, treat any injuries and neuter/vaccinate the animals. One black dog named Gigi who is one of the guard/jungle dogs was rescued pregnant and gave birth to six puppies, five of which survived and are also the sanctuary’s guard dogs. All of the dogs are up for adoption worldwide (it costs USD $600 to adopt a dog and this includes flights). The volunteers who run the dog rescue are called Jack and Louise, and they let 15 dogs sleep on their bed with them at night! 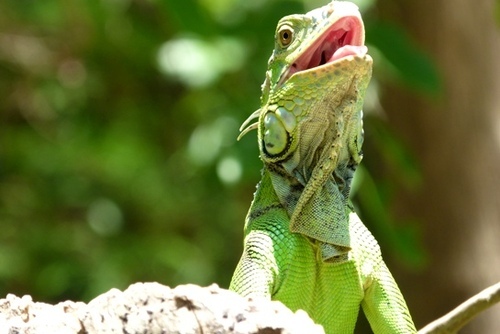 The Cambodia Wildlife Sanctuary is financed through the volunteer program and private donations. Rescued aged 24 from a life in the illegal logging trade. 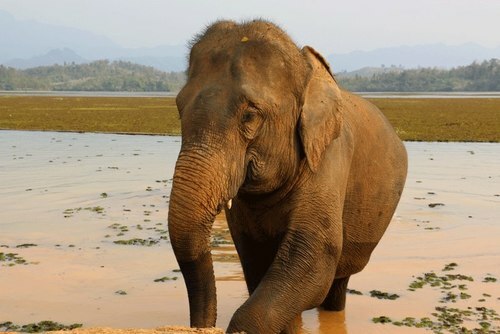 Relatively young as Asian elephants can live until between 60 -80 years. 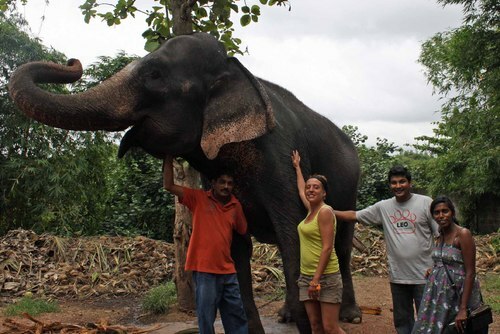 Rescued in 2013 with another elephant who has since died from old age. 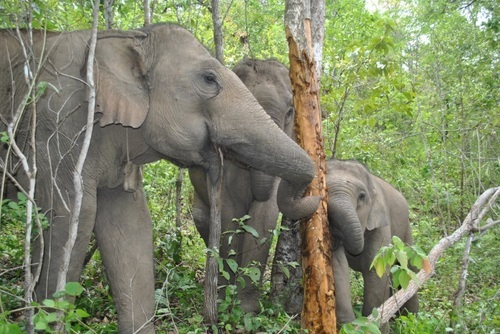 Arun-Reah worked her entire life until her rescue in the logging industry. Does not socialise with Arun-Reah and Sarai-Mia as she prefers being on her own, Sarai-Mia also tries to fight Di-Poh when she sees her. 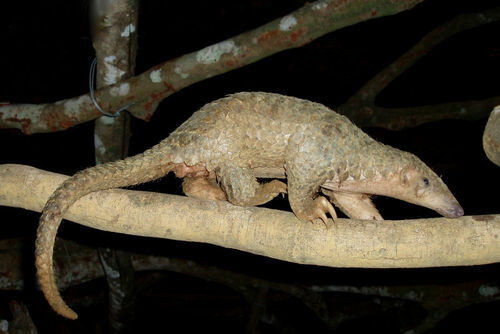 Rescued from the illegal logging trade. 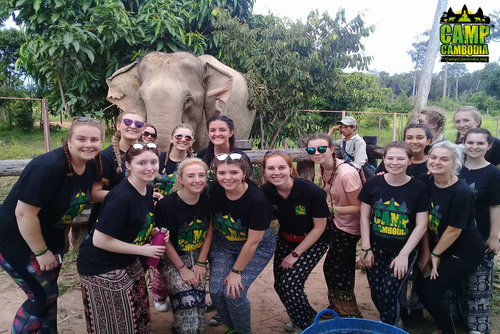 There are several companies offering opportunities in Cambodia and I booked my trip through Reach Out Volunteers, a worldwide organisation which aims to help animals, conservation and provide humanitarian aid. When I arrived at Siem Reap airport after a 22-hour journey, I was met at the gates by a very enthusiastic Australian named Jade, who was to be my team leader for the week. We travelled to the city of Siem Reap by tuk-tuk…an experience in itself (the rules of the road are very different to England!). I was settled in a hotel room with my roommate for the evening, Leah, who had travelled from Texas State, and we went for a walk around our new surroundings. The next (very early) morning, we boarded a coach with around 15 other volunteers who had all spent a week in a village building houses and schools. There was mix of people from all over the world, solitary travelers like me; families and a range of ages. We arrived. At the sanctuary after a two-hour journey, and we were introduced to Sam, the other Reach Out team leader, the sanctuary dogs (Gigi, Alfie, Milo, Mark, Mai and Mickey) and the three rescued elephants. As there were so many of us we were split in to two groups; I was in group A and we were the first group to experience the ‘Jungle Walk’, easily the best activity for me. 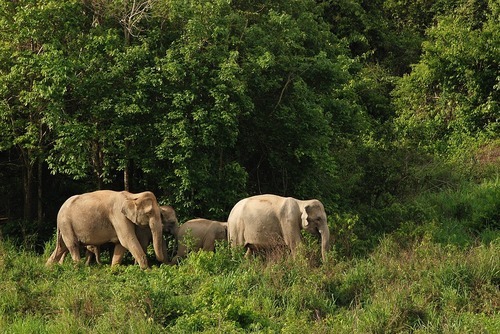 During this morning we escorted two of the three elephants and their mahouts on a walk through the Cambodian jungle. After this we prepared food for the elephants in their very own kitchen, and later, when the had returned, we fed them the sugar cane that we had chopped up. To be so close to an elephant is surreal and life-changing. They are huge. Bigger than what you expect, but they are so gentle. I found out that the skin of an elephant is the same thickness as a human’s, which makes it more relatable when you find out what they have been through and the pain they have suffered. 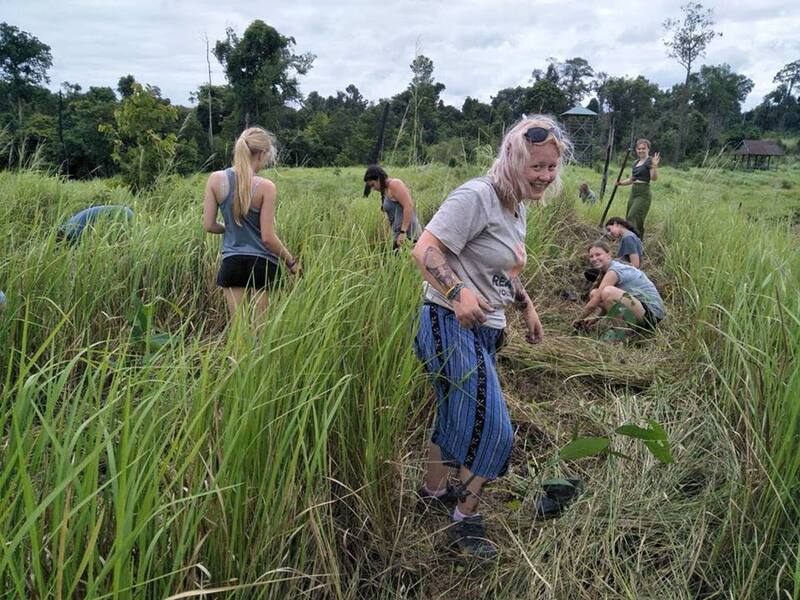 Over the next few days we planted seeds in the greenhouses, planted sugar cane fields, cleaned out duck ponds and travelled through parts of Cambodia to raise awareness and meet the locals. The third morning was spent teaching English to children in a primary school, and that afternoon we took part in a Buddhist tree blessing ceremony with a Bhikkhu. The Bhikkhu blesses a scarf in the ceremony and the scarf is then tied around a tree. This stops the Buddhist population from cutting down the trees and helps save the forests. We walked and looked after the rescue dogs, were introduced to the baby gibbons (so cute!) and walked past the leopard cat’s enclosure (we couldn’t see them as they were completely wild and hid from people). The biggest job was helping dig holes for the new elephant enclosure…the fire ants were on form that day (I still have bite scars). The morning before I left the sanctuary was spent in the middle of the jungle, planting the seedlings from the year before. It felt amazing to be part of reforestation and providing a habitat for future wildlife. 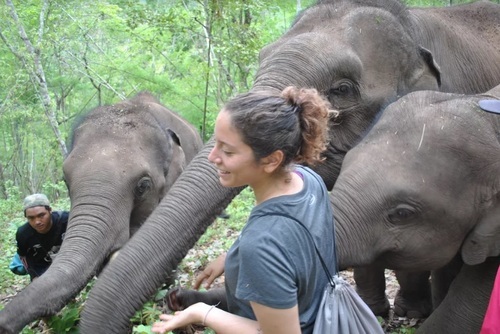 Our group then got to spend three hours ‘hanging out’ with the elephants as they wandered around the jungle clearing. When we set off for Siem Reap the next day we still had two nights left. So, we shopped at the Night Market and went for food, generally experiencing the culture of the city and enjoying hot running water for the first time in a week. Bucket showers are an experience. I also slept for 13 hours straight. On the last day I visited Angkor Watt, the temples which arguably form the heart of Cambodian culture: the inspiration for King Louie’s ruins in Disney’s The Jungle Book and part of the set for 2017’s Tomb Raider. I then went wild swimming in a stunning waterfall. 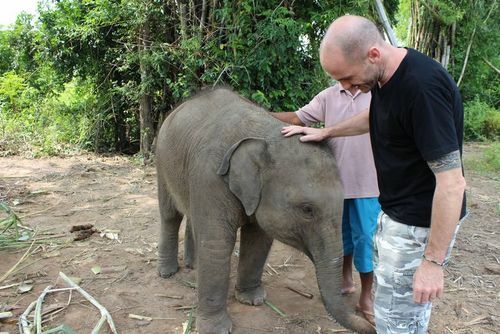 If you are planning to travel to Cambodia and would like do play a small role in helping then there are lots of different opportunities available like visting, donating to or helping at a wildlife sanctuary. Donations made through volunteering really helps wildlife sanctuaries and I can’t wait to go back and participate again. I would urge anyone with an interest in helping wildlife to do something similar. My experience was really eye opening and life-changing so what are you waiting for, search volunteer programs in Cambodia today!